Fairly easy to configure with lots of options for use. 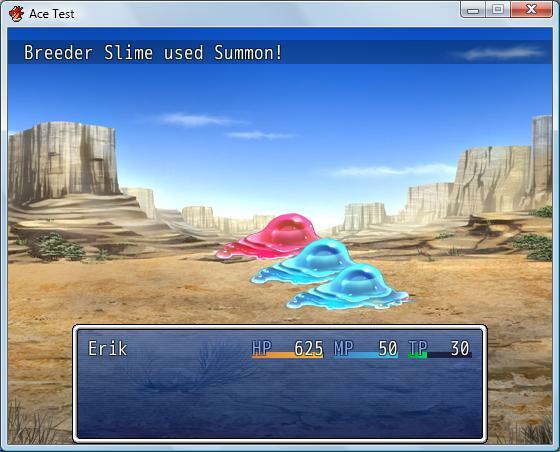 Can make the same skill summon different kinds of enemies. Please see the header for instructions on how to use. Don't worry about the Japanese characters, ignore them. They don't really mean anything. No issues found yet, but I suspect it won't work with Custom Battle Systems. I didn't feel it necessary. You can get the VX version demo here, it works exactly the same way. This was a pretty easy port, but not as easy as I anticipated. I still have to figure out how the damn Scene classes work (Ace changed a lot). Free for use in non-commercial projects, with credit. For commercial projects (seriously?) contact me.